TOPIC: Triple Buffering ala D3Doverrider? is this on the cards in the future, specifically for DX10+DX11 games? Would it be difficult to implement? As mentioned in the other thread the only tool out there for these things is RadeonPro, which doesn't hook with every game and is no longer supported. Until Gsync monitors takeover the market completely the need for tripple buffering will be there, especially when it would work with sweetfx. You can set game to work in windowed mode, and use Borderless Gaming instead. Hmmm.. thanks, but I can't quite see what the benefit of that is....? Could you explain? In windowed mode game uses Windows own Triple Buffering (you must have Areo enabled), and Borderless Gaming simply gets rid of the windowed mode borders, so it looks like running full screen. It's easier to use D3Doverrider, and works with every game that has windowed mode, and generally has lower input lag. Ok thanks for the explanation, but there's a few issues I see with this approach. Desktop composition (Aero) uses double buffering, not triple buffering. 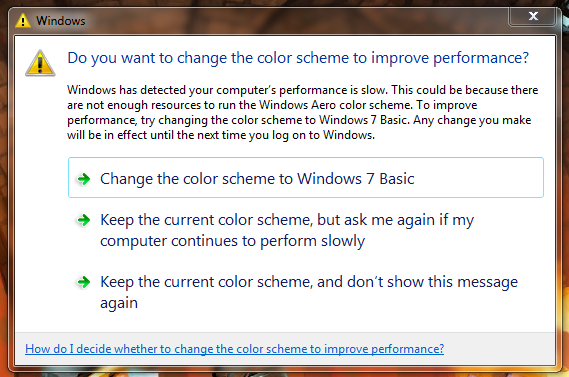 With Aero on, I get no screentears but I also get an annoying "not enough resources" message that is impossible to switch off 5-10 min. into the game that is unnaceptable in multiplayer as it throws me out and takes about 10 seconds to get back in the game. Fullscreen on/ Aero off/ triple buffering via D3D overrider - it doesn't produce any tangible input lag in Cliffs of dover. I hope this explains the problem I'm having. Can i ask you what is your setup? What setting are you using? Asus P8p67 rev 3 Mobo, I5 2500 non K @ 3.3, ASUS STRIX GTX 970 3.5GB, 12GB 1333 DD3 RAM, I have a dual monitor setup but don't use spanning, always use one at a time. CPU first core is 50-80%, rest comes and goes in spikes, but never maxes out. I hear this is because the game is not that well optimized and mainly utilizes 1st core. I use Trackir 3 to move my head around in the virtual cockpit (il2 cliffs of dover is a flight simulator) and found that d3doverrider helps massively with the smoothness of movement when fps drops to 40-45. Fps is generally at 80-120 in regular situations but can drop to 40-45 when flying low above an enemy airfield with lots of static models. I have recently been using inspectors option of vsync 1/2 refresh rate so get 60 fps stable. but the dip from 60 to 40-45 is what's so noticeable with my TrackIR without d3doverrider. Ok, so I assume that adaptive V-sync is out of question? And RadeonPro doesn't work? Maybe the game is 64bit only? You have to turn on support for 64bit games in RPro by clicking on blue 32bit icon in bottom-right corner until it will change to 32bit/64bit. Anyway, ReShade use to have Triple Buffering support, but it caused crashes with some games, so it was removed and it's probably not coming back. You're right adaptive vsync is not a solution as i would see tearing under 60fps. RadeonPro just doesn't hook, I tried everything even had somebody on teamspeak try and talk me through it. All the necessary settings are there etc. but it doesn't hook, I tried 32 bit only, 32/64 bit, and always launching through the radeonpanel.... it hook ok in other games though. Game uses 1.5GB VRAM (without DSR) so shouldn't be a problem really. in-game aliasing is FXAA (that's another of my pet peeves. I run that + SMAA for a slightly better look. DSR gives near ideal results but affects distant contact spotting, which in multiplayer is the most important aspect of staying competitive). So FXAA even with SMAA injection doesn't eat more then 3-4 fps. Actually the most demanding option seems to be forest - trees. If I switch them off the smoothness of gameplay improves but it's kinda unfair to others The game has a bug where you can fly through trees without collisions so most player avoid trees out of respect for their adversaries - not to have an unfair advantage. If I switch them off I might be flying through trees without knowing. Triple buffering - Yes Crosire did mention that, but it was only for DX9, which won't help me as the game is DX10. Last Edit: 4 years 3 weeks ago by hnbdgr.